choosing the right variety is an integral management decision, one that requires careful consideration of all the options. A great resource available to farmers is the Ontario corn, soybean and wheat performance trials, conducted by their respective committees. Although the Performance Trials are distributed with this magazine, the most timely way to access information gleaned from the trials is by getting online. 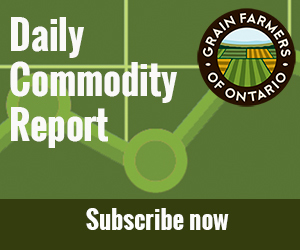 “We try to have the corn performance trial results uploaded to the web site by the end of November, if possible,” says the Chair of the Ontario Corn Committee (OCC), Greg Stewart. The committee is responsible for the Hybrid Corn Performance Trials and www.GoCorn.net. In addition to posting the printed versions of the trials, the sites are updated as new information becomes available ensuring farmers are seeing the most up-to-date data. For example, it takes time to get the Fusarium testing results from the Spring Cereals Performance Trials and the data is added to the website as it comes in, says Martin Harry, Chair of the Ontario Cereal Crops Committee (OCCC) which manages the Spring and Winter Cereals Performance Trials and the www.GoCereals.ca website. Often the websites are also more comprehensive than printed reports. The www.GoSoy.ca website contains information and graphs not available in the printed version, says Tom Welacky, Data Coordinator for the Ontario Oil and Protein Seed Crop Committee (OOPSCC) which manages the GoSoy website and the Ontario Soybean Variety Trials. The websites also have the advantage of being interactive. One of the most powerful producer tools on the GoSoy website is a feature called the Variety Information and Performance Profile (VIPP) menu which allows growers to select and compare varieties in detail, explains Welacky. In the Variety Selection area, farmers can select a list of varieties that match their personal requirements for traits such as hilum colour, herbicide resistance and distributor, among others. For the list of matching varieties, the variety name can be clicked on to show the available performance data for the selected variety. In the Head to Head comparison area, farmers can select any two to five varieties within each of the Ontario Heat Unit Zone trials and compare many performance traits at once, showing one to five year averages based on the available years of testing. The GoCereals website is set up similar to the soy website, says Harry. Growers can use the site as a tool to compare up to three varieties in a Head to Head comparison. On the GoCorn website, performance trials from 1987 to 2008 can be searched for Head to Head comparison, adds Stewart. An Economic Calculator is also included. Performance trials offer farmers an unbiased comparison of varieties grown under similar conditions. “The more data farmers have to make decisions about what to grow, the better,” says Harry who is also quick to caution farmers about the dangers of looking at just one year’s data. “Look for varieties that are stable over many years,” he recommends. For the Hybrid Corn Performance Trials hybrids are divided by heat unit ratings into six groupings. Each hybrid must be entered in all trials within a table and all are replicated. Poncho 250 was applied to all sites in 2009 for soil insect control. Yield index (a percentage above or below the trial average), lodging, test weight and moisture content are reported for each hybrid. This year’s Corn Performance Trials Report is the first one to reflect recent changes made in the Crop Heat Unit system. Average heat unit accumulations are now calculated starting May 1, resulting in an apparent increase in the heat unit rating for most parts of the province. This change is greatest in the cooler parts of the province. “This doesn’t mean that we are receiving more heat than we used to,” explains David Morris, Secretary of the OCC. “It is largely a reflection of the fact that farmers are planting earlier than they did when the heat unit system was first developed. For the most part, farmers should continue using hybrids of the same maturity as before,” he adds. The entries for the Ontario Soybean Performance Trials are separated into two categories, one for glyphosate tolerant soybeans and the other for conventional and food grade soybeans. Separate tests are conducted for Phytophthora tolerance, performance of Soybean Cyst Nematode (SCN)-resistant soybeans in SCN-infested fields and there’s also a limited amount of white mould testing, explains Welacky. After harvest, the performance results are uploaded into the GoSoy.ca database and tables are automatically generated. The results are reviewed by the test co-operators, then by seed companies and breeders and other committee members before being released to the public. The major features of the GoCereals website are the performance trials for both spring cereals and winter wheat, says Harry. There are usually four repetitions at each of three or four locations each year. In addition to yield, characteristics such as lodging and disease are also reported. The site also has average yield data for the past five years when available. In the past, all the performance trials were conducted on untreated sites however, it is likely that comparisons on sites treated with fungicide will be added in the future, says Harry.